NEW YORK DONUT: Every corner of New York has its doughnut now. There is room for all of us, the minimalist and the profligate, the nostalgist and the radical. The donut is prehistoric — fossilized ring-shaped cakes have been unearthed, dating back 8,000 years. Free doughnuts were handed to the huddled arrivals at Ellis Island, to lines of hollow-cheeked men during the Great Depression and to soldiers on the battlefields of the First World War, by Salvation Army volunteers who requisitioned helmets as deep fryers and punched holes with spent artillery shells. WHOLE MILK NOT THAT WHOLE: Whole milk isn’t made wholly of fat, or largely of fat, or even substantially of fat. In fact, it doesn’t contain much fat all. Whole milk is actually only about 3.5% fat. ZIP CODE DEMOGRAPHICS AND LIFESTYLE: Want to know what your zip code says about you? Learn about the people and culture of an area with ZIP Lookup. Arlington, VA: 56% Metro Renters & 44% Laptops and Lattes. We’re affluent, well-educated singles or partner couples, who hold professions in business, finance, legal, computer, or entertainment. Young, mobile, or still in school, we live along or with a roommate in rented apartments. Long hours and hard work don’t deter us. Most of our income goes to rent, fashions, and latest technology. We live close to our jobs, so we can either walk or take a cab. We practice yoga, go skiing, and attend Pilates. Bensonhurst, Brooklyn, NY: Asians, particularly Chinese, are concentrated here. Nearly half are foreign born and 1/3 don’t speak English. Long commutes are the way of life. Spending is careful; we’re not brand loyal and use coupons when we can. Dancing, casino gambling, eating out at our favorite restaurants consume our leisure time. 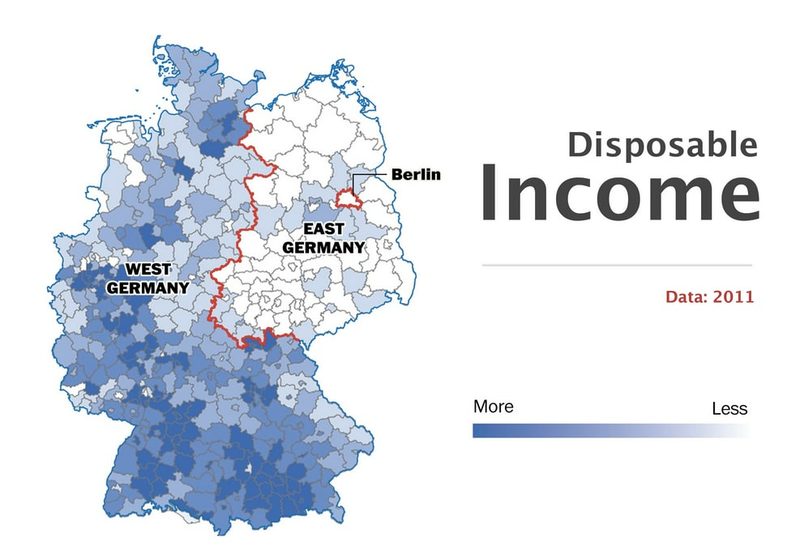 West & East Germany: Those in West Germany have greater disposable income, lower rates of unemployment, more young people, more foreigners, and more trash. East Germans have more childcare, bigger farms, and higher flu vaccination rates. German statistical office. Visualization: Gene Thorp, WAPO. SELFIE MAKEOVER APP: If you haven’t been hitting the gym lately, Photox can add six-pack abs ($3.96), give you skinny legs ($3.96) or bulk-up your arms ($2.97). If it’s a dermatologist you desire, the app can also minimize wrinkles ($2.97), lighten skin ($3.96) and remove acne (99 cents). Photox is connects people with a team of experienced photo editors who can alter images as quickly and naturally as possible. DIGITAL INFIDELITY: Facebook users in relationships frequently use the site to keep in touch with “back-burners” — exes or platonic friends they know they could connect with romantically, should their current relationships go south. Men have back-burners at roughly twice the rate of women. On average, respondents in relationships said they had romantic or sexual conversations with two people (!) besides their current partner. FREE TUITION FOR AMERICAN STUDENTS: 7 countries where Americans can study at universities, in English, for free (or almost free). Click link to read more on Slovenia and Brazil. Germany: Americans can earn a German undergraduate or graduate degree without speaking a word of German and without having to pay a single dollar of tuition fees. About 900 undergraduate or graduate degrees are offered exclusively in English, with courses ranging from engineering to social sciences. Finland: Finland will finance your education, but not your afternoon coffee break. Sweden: Only Ph.D programs are tuition-free. Norway: Norwegian universities do not charge tuition fees for international students, though Norway has the highest costs of living for expats. POWER SUIT: Want to project power? Your clothes have to fit you. To be a power dresser, it has to look like you command the clothes, not that the clothes are commanding or wearing you. The 1980s was the reign of the floppy bow tie and the suit. And that was the look most women wore in their 20s and 30s when they started in the workplace. By the ’90s, women began to hang up their broad-shouldered jackets to favor the softer, more luxurious fabrics used by designers like Donna Karan. GOOD JOB MOST IMPORTANT IN A HUSBAND: What ever-married women want in a spouse, more than anything else, is someone with a good job. 78% of women said steady employment was important to them in a partner, more than the 70% who wanted someone with similar ideas about raising children, or the 38% who cared about sharing moral or religious views. There are no gender differences between the spousal personality traits that helped a woman’s career and the ones that helped a man’s. In both cases, having a conscientious partner is the only trait that had any measurable correlation. What allows someone to lean in is a conscientious partner. It’s something both sexes should think about in their careers.